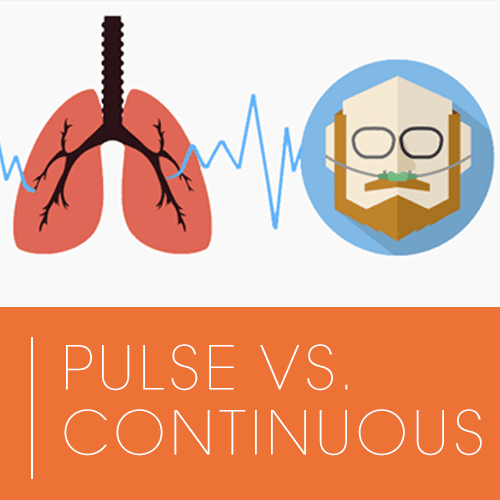 Pulse Flow vs. Continuous Flow: How do I know which one I need? Pulse flow is based on breathing and inhaling, whereas continuous flow, as its name implies, is delivered at a constant rate indiscriminate of the user’s breathing. Continuous flow is like a water fountain. If you stand in front of a water fountain flowing at 1 liter per minute, they don’t actually drink one full liter of water. The amount of water a person drinks is the number of sips and the size of the sip. The rest of the water is wasted. The same applies to continuous flow oxygen; the net amount inhaled is a combination of the flow rate, the number of breaths and the size of the breaths. Pulse flow is more sophisticated. Pulse mechanisms are more sensitive, utilizing an oxygen conserver and the most advanced technology to deliver oxygen based on breathing rates and other factors. Pulse flow is more comparable to drinking from a glass of water through a straw; the intake will be based purely on the amount and intensity of sips. When an oxygen concentrator is said to be a main solution for on-the-go, at home, and sleep, it usually employs this type of technology so that it can deliver the proper amount of oxygen during all phases of daily activity and during rest. Based on this difference, it’s also important to consider how you’d like to use the oxygen: on-the-go, at home, or just for sleep. Pulse flow oxygen concentrators are the most efficient and preferred for daytime activities such as shopping or traveling by plane or car, and reducing the weight strain on your body that tanks cause. Continuous flow oxygen concentrators are a sufficient option, particularly if you require nighttime oxygen for sleep apnea or will be in high altitude. More logistical factors to consider are size, weight, and battery life of the oxygen concentrator. Think about your daily routines, and how adding this device might alter them, if at all. Pulse oxygen concentrators are lightweight, from 3 pounds to 6 pounds, and easy to carry. Pulse oxygen concentrators are very easy to travel with and are airline-approved devices that provide 8 hrs of battery life per battery! Pulse dose oxygen concentrators measure output based on a scale of intensity (usually 1-5). Patients must use a pulse oximeter to determine which setting works for them and meets their requirements for their needs. Continuous flow oxygen concentrators are built to provide oxygen constantly, all day and all night, for long periods of time but they weigh on average 14 pounds and up and they have 1/3rd the battery life of the light weight portable. Your prescription will only tell you how many liters per minute you need. It’s up to you to decide if you want a pulse flow for light weight use or continuous flow oxygen concentrator. Continuous flow oxygen concentrators work a lot harder than pulse flow concentrators and some patients need that durability, especially patients who need oxygen when they sleep. The final factor, of course, is consulting with a Portable Oxygen specialist to establish a plan that you are comfortable with.